I'm working on some code where I need to show some trend date over various periods of time. 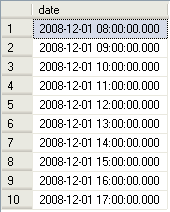 One of the issues with working with SQL and aggregate values is that it'll only show you values where there was some data, so if you want to print the number of orders on each day and some days had no orders, they wouldn't show up in the results. For what I was working on, I needed to ensure that even missing days would show up in my query results. This got me thinking about the best way to accomplish this task. After thinking about the problem for a while, I decided the ideal method would be if I could dynamically generate a table of dates that I could then use in a LEFT OUTER JOIN. if your output would generate more than 100 records. The datepart is any valid MSSQL datepart as a string (i.e. d, dd, day, etc.) The step is the incremental value to use and will stop once the date reaches the end_date. Good idea. Though if this is used often I would recomend using a phisical table with all days you would ever care about and a hour table that you join to also when you need hours. This would save the cpu cost of generating it every time you need it. With a phisical table you can have additional columns like is holiday. Financial year, days till christmas ect. Also 'sql for smarties' has a section that covers using days table and some uses. An interesting approach. As a thought experiment as to eliminating the recursive factor, how about this? 1. Figure out the final row count using the DateDiff and the DatePart. Call it @Parts. This is a constant-time operation. 2. Calculate the base-2 log of @Parts. Call it @Bits. This is also a constant-time operation. 3. Create a temp table #Digits ( i int ) and insert two rows (0) and (1). 4. Select #Digits into #Digits2. 4. Join #Digits with #Digits2 and have (i = (#Digits.i * 2) + #Digits2.i). Store the result back into #Digits. 5. Repeat Step #4 (@Bits - 1) times, which will give you a table of the numbers (0 .. 2**@Bits). 6. Return the result from a query of #Digits where (i between 0 and @Parts), but instead of returning column i, return date = dateadd(@datepart, i, @startdate). If you want to decrease the number of loops over Step #4, make the seed size for #Digits 10 rows instead of just 2, then use the base-10 log. I did some looking into creating a physical table, but the pain of maintaining a physical table doesn't seem to provide enough of a performance boost to warrant doing it. Also, the stuff I'm doing is highly dynamic, so I might need to grab "Orders" in 30 minute intervals throughout a specific day. A physical table would just be too much of a pain to maintain, especially since there is very little performance difference. In this dynamic method you're really creating rows over a few dozen, so there's very little overhead. Before I read your post last night, I was doing some more thinking and realized it would be really nice to also include an "end_date" column (which is the end of the time range.) This will make it easier to things such as show all the orders in 30 minute intervals through a specific day. Also, to get rid of the recursion issue, I just made the UDF a multi-statement function and I just do a simple loop--which I think should be less CPU intensive than your recommendation and require less cycles. I'm going to write another blog entry with my new revised function. I suspect that yours would win for small n, but wouldn't scale when n is in the hundreds or thousands. But if I get some time today I'll code up a version of my solution and see how they compare. Take a look at the new article I posted today--I'm interested in your feedback. The problem is I need a variety of ways to break things up--days is just one way. I also need to get break downs by hours (or possible blocks of 30 minutes, etc.) Generally speaking I'm only dealing with resultsets that less than a few dozen rows. I did some testing with a physical table, but the overhead of the indexes, etc didn't seem to offer any real performance difference between creating these small recordsets dynamically or calling them from a physical table. If I needed to do this over 1,000 or rows, that's when there's a noticeable difference, but for small dynamic ranges this seems to work very well.